Having two men named John Grothaus and coming from the same village, Gesmold, can make researching them difficult. The first John came in 1842 and the second in 1857. It’s believed they are related. Possibly uncle and nephew. Here is what I’ve found on the first John. Johann Georg Grothaus did not cross the Atlantic with the first group of settlers. That group was aboard the “New York” which docked in the New York harbor on 26 October 1842. Johann George Grothaus and D. Kaverman came to America aboard the “Westphalia” from Bremen to the New York harbor, landing five days after the “New York” on 31 October 1842. I’m sure, but haven’t verified it, that they meet up with the group from the “New York” and journeyed to Ohio together to found Section Ten, later named Delphos. Maria Gertrude Krieft, at age 18, was aboard the “Isabella” when it landed in the New York harbor on 20 September 1844, along with her parents, eight siblings and the others who had journeyed with Father Otto Bredeick. Maria Gertrude was born 27 May 1825 in Gesmold, Osnabruck, Stadt Osnabruck, Niedersachsen, Germany to Casper Herman and Maria Elizabeth (Henseler) Krieft. John Georg Grothaus and Maria Gertrude Krieft were married on 29 April 1845 in Saint John the Evangelist Catholic Church, Delphos. This was the first marriage to take place in St. John’s. On the baptism records of John and Gertrude’s children the last name is spelled Grothaus. — Casper August was born 10 February 1846 and was married to Catherine Recker, born 16 September 1852 to Herman Bernard and Maria Gertrude “Dota” (Hempker) Recker, on 27 August 1870 in Saint John the Evangelist Catholic Church, Delphos. Casper August Grothaus/Grothouse died 14 November 1902 and Catherine (Recker) Grothaus/Grothouse died 1 April 1931. Both are buried in St. John Cemetery, Delphos with their tombstones engraved with Grothouse. — Maria Theresia was born 28 December 1847 and died unmarried on 17 June 1924. Maria Theresia Grothaus/Grothouse is buried in St. John Cemetery, Delphos. — John was born 7 June 1849 and died at over 10 years of age (death record states he was 6 years of age) on 27 September 1859. 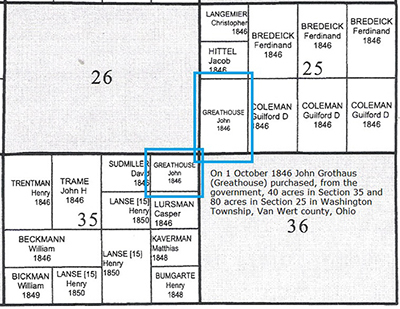 John Grothaus/Grothouse is buried in St. John Cemetery, Delphos. — Casper Henry was born 25 February 1853 and was married to Mary Magdalena Davis, born 27 August 1860 in Allen county to Michael and Helena (Lang) Davis, on 18 February 1886 in Saint John the Evangelist Catholic Church, Delphos. Casper Henry Grothaus died 24 May 1938 and Mary Magdalena (Davis) Grothaus died 28 September 1945. They are interred together in St. John Cemetery, Delphos under a tombstone engraved with the Grothaus name. — Catherine Florentine was born 22 January 1855 and died on 13 November 1859, at age 5, a month after her brother John died. Catherine Florentine Grothaus /Grothouse is buried in St. John Cemetery, Delphos. — Joseph Martin was born 22 March 1857 and was married on 10 May 1881 in Saint John the Evangelist Catholic Church, Delphos to Mary Gertrude Falke, born 15 March 1860 in Dayton to Francis and Catherina (Wehage) Falke. Mary Gertrude (Falke) Grothaus died 17 February 1935 and Joseph Martin Grothaus died 30 July 1939. They are buried in St. John Cemetery, Delphos with a tombstone engraved with Grothaus. — Maria Sophia was born 19 August 1858 and was married to 23 September 1879 in Saint John the Evangelist Catholic Church, Delphos to George Auer, born 28 October 1856 to Joseph and Barbara (Schrim) Auer. George Auer died 23 September 1936 and Maria Sophia (Grothaus) died in Cleveland on 3 June 1953. They are buried together in St. John Cemetery, Delphos. — Bernadina was born 7 November 1860 and was married in Allen county to August Heidenescher on 20 October 1885. August was born by Landeck on 26 December 1860 to Heinrich and Elisabeth Anna (Osterheide) Heidenescher. August Heidenescher died 12 November 1931 and Bernadine “Dina” (Grothaus) Heidenescher died 17 November 1942. They are buried in St. John Cemetery, Delphos. — Catherine Elizabeth was born 13 July 1865 and she married Frank Langmeyer in Saint John the Evangelist Catholic Church, Delphos on 17 November 1878. Frank was born 4 January 1860 to Franz Christopher and Katherine Elizabeth (Kuhlman) Langmeyer. Catherine Elizabeth (Grothaus) Langmeyer died 12 July 1918 and Frank Langmeyer died 31 December 1933. They are buried together in St. John Cemetery, Delphos. In the late 1890 the name Grothaus would sometimes be spelled Grothouse. Johann George Grothaus died 11 January 1876 and Maria Gertrude (Krieft) Grothaus died 4 September 1898. They are buried in St. John Cemetery, Delphos.